I see there are more doom laden prophecies from the Warble Gloaming mob. Have you noticed how the formula never changes – if we don’t do X in Y years then Z will happen? X is an always increasing variable and Z is more doom laden as time passes, but Y is always a positive value? So I was reading their usual stuff about how we must stop using coal and oil instantly, if not before, or else untold calamities and catastrophes will fall out of the sky. There will be plagues of locusts and groups of four horsemen will be a regular sight. We’ll be heating our homes with fire and brimstone. A bit over half way down the page though I came across an interesting video. It’s all about Boulder 293 [did you know that individual rocks apparently have names? I didn’t] which has shifted. Now Boulder 293 [known to his friends as Rock] weighs 620 tons and has moved a bit. They don’t make it clear whether 293 shifted as a result of Warble Gloaming or whether it is in fact the cause. They overlook other possible reasons why it may have moved, but then these people tend to ignore little items that may not suit their agenda. Could the boulder have shifted simply because it fancied a different view? Maybe it was the fairies? Maybe it was a prank by a couple of the local teenagers [they breed real men on the Aran Islands]. It also begs the question as to why Boulder 293 was chosen. Why didn’t they choose Boulder 576 on the Oregon coast that hasn’t shifted in a thousand years? Or Boulder 3980 in Brazil that weighs over a thousand tons and nips down to the shops every Friday afternoon? 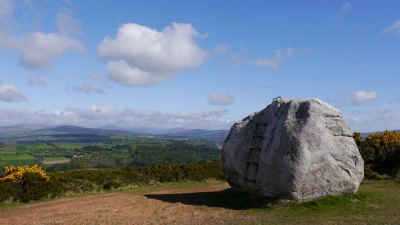 Why not the Mottee Stone in Wicklow which as some point before calendars existed decided to climb a mountain to get a better view its friends in Wales? Anyway, I would suggest a couple of alternatives. They could super-glue 293 to the bedrock? Or else they could dynamite the thing and turn it into a million harmless pebbles which could be then tossed into the sea. That would put an end to all this Warble Gloaming nonsense. Moving boulders is a change from statues. Damn! I forgot the religious possibilities. God changing the Earth’s centre of gravity to adjust our rotation to keep in time with atomic clocks? It’s a Colorado phone number. Never updated from the 1920s. Belonged to a climate soothsayer. Depending on how much you paid him (research grant) he would forecast drought, or flood or anything you wanted. He could forecast yesterday’s weather with 100% accuracy. Next week with much less accuracy, but 30 years (beyond his retirement and into his dotage) in future with 97% accuracy. He shared W.C. Field’s conviction regarding suckers and their money.